The second title of this work allows you to specify the date of its creation – this is the first half of the 1940s. Recall that this is how Pollock initially called his “Pasiphae”. 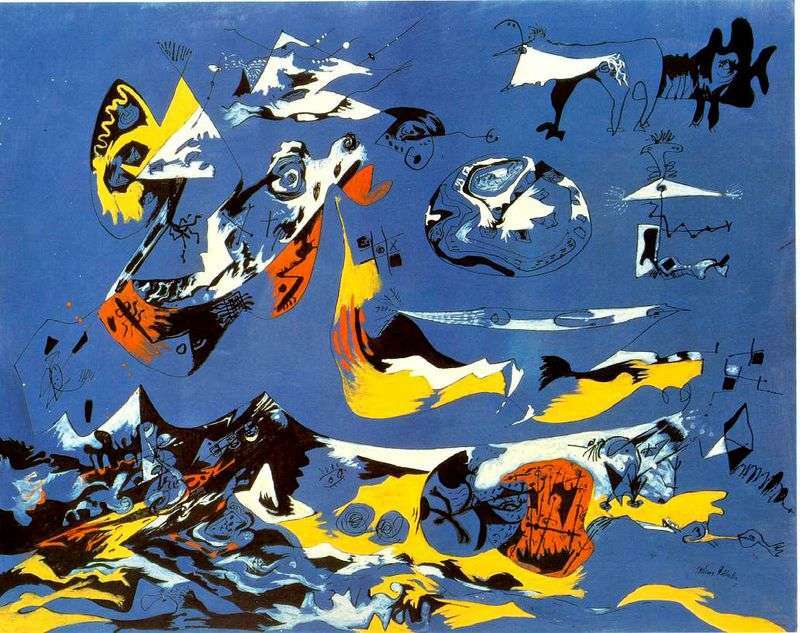 This picture reveals two strong influences experienced by Pollock at this time – surrealism and the ideas of Kandinsky, who by the early 1940s had abandoned geometric figures and began to “scatter” biomorphic figures on a blue background. By the way, the term “abstract expressionism” in the 1920s was used to describe the style of the early works of Kandinsky, the founder of abstractionism. When the “action” becomes the art of Pollock as its phenomenon seemed to respond to the American longing for his own great artist. Critics have created a myth out of him – a myth about an original master who grew up from the original Indian culture, from his native soil and who has nothing to do with “pampered and languid” European art. About the creator of “American painting”, distinguished by reckless courage, energy and freedom, and most fully meeting the character of a young nation. Meanwhile, the very synonym for “American painting” – “abstract expressionism” – already indicates the Pollock genealogy. In this term lies the philosophy of the artist. Another synonym – “painting action” – precisely describes its “technology”. In close cooperation of these vectors, the revolutionary art of Pollock was born. Description and meaning of the painting Blue by Jackson Pollock.